The raw material of glass is silica sand. They are the glass packagings, glass bottles and jars used in daily life. Glass bottles and jars turning into packaging waste after being used are recovered and turned into broken pieces of glass and are transformed to glass packagings again after being processed. Parcels and similar packaging holding many products together are usually made of cardboards. 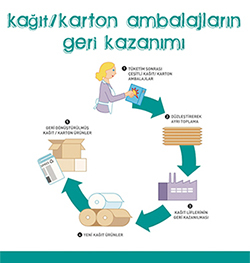 Paper and cardboard packagings are used in many sectors such food, textile, cosmetics and electronics. 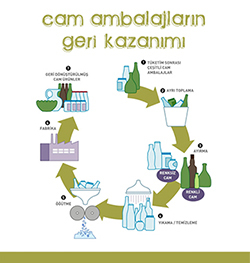 For recovery, these packagings should be collected separately, cleanly and without being wet. Upon the recovery of paper and cardboard packagings, paper and carton is reproduced, forests are protected and energy saving is provided. Composite material packagings are used in the packing of beverages such as milk, fruit juice and liquid food products. These products are formed by 80 percent of paper and a small amount of plastics and aluminium. With the recycling of used composite, roof insulation material, flake boards having high mechanical resistance towards humidity are obtained. These materials are used in packaging and furniture sector. Besides, the paper fibre in the composite packagings is transformed into various paper types and utilized in the economy. Metals are produced as a result of the distillation of various minerals covering the earth. These are steel and aluminium. Examples of metal packaging are oil containers, preserve and beverage cans that we use in everyday life. 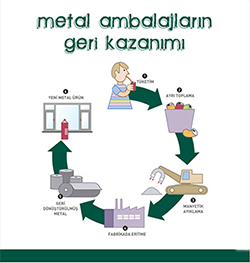 Upon their recycling, any kind of metal material can be re-produced. Plastic is obtained from petroleum or its derivatives. Among various types of plastic packaging the most prominent are PET (polyethylene terephthalate), PVC (polyvinylchloride), PP (polypropylene), PS (polystyrene) and PE (polyethylene) according to their chemical structures. PET is mostly used in packaging of bottled water, beverages and oil. PTE is recycled and turned into synthetic fibre and filling material. It is used in furniture and textile sector. 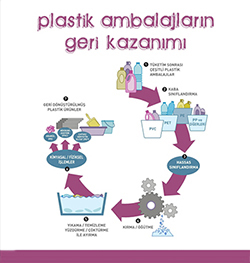 Many packagings such as detergent and bleach containers, and shampoo bottles are produced from PE. These materials are also produced from the recycling of PE. The packagings of water, liquid detergents, certain chemicals and healthcare and cosmetic products are produced from PVC. By the recycling of PVC, water pipes, floor coverings and various construction filling materials are produced. 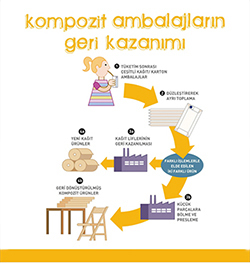 PP is being used in the production of lids of detergent containers and margarine cases and products such as stationery materials and synthetic carpet backs are produced when it is recycled.